This begrudgingly sickly yet alluring pudding feature enjoyed a window of mid-1980s ubiquity when any mum with a modicum of sense made sure a substantially-filled bottle was always ready in the cupboard. 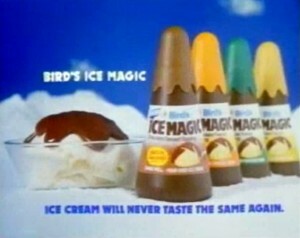 Ice Magic lived in a crappy plastic squirty pyramid at room temperature, but when applied over ice-cream turned from runny liquid to a rock-hard solid, forming – depending on the application – a wafer-thin veneer (for wimps) or a massive crust (for die-hard dessert denizens). The only problem was you had to wait fifteen minutes for the thing to harden, by which time you’d invariably excavated all the ice-cream and were left with a lump of chocolate you may as well have got from out the biscuit tin. My family were just a bit miffed when this vanished in the early 1990s. Recently my girlfriend had some sauce that set in a similar way but was a different brand. Still going strong here in the US, under the name Magic Shell. The trick is not to have your ice cream in a single lump, but rather have lots of crevices for the stuff to fill and harden in. More chocolate* that way! * not actually chocolate, and avoid the other flavours. I remember Blue Peter did one of their making things specials and they stuck googley eyes to the lids, to make ghosts. Sometimes it didn’t set, which was rather disappointing because we used it to disguise the fact we were eating that non-dairy fat cheapo ice cream that came in massive Tupperware tubs at the time.